Carinn; carerynn | Malaysia Fashion, Beauty & Lifestyle Blog: Lifestyle/ Fashion: Functional and Creative Bags by Terminus! Lifestyle/ Fashion: Functional and Creative Bags by Terminus! This post is dedicated to the travellers and working crowd out there who is forever jetsetting off from one place to another, from one meeting to the next. I know too well just how hard it is to keep your packing to a minimal because I always tend to overpack even if it's just a day-trip back to my hometown >< One big problem I always face is that it's hard to decide which bags to bring with me when I'm travelling and insufficient luggage space due to all the gadgets and clothes I carry with me. This is where Terminus comes into the picture to solve this problem! Terminus is a world-class, design-oriented brand that believes in no boundaries for its innovations and creativiy, drawing inspiration from all over the world. They have just recently opened a store in One Utama Shopping Mall. It is a home-grown brand established in 1994 that allows you to experience bags with unique and functional designs to suit your ever differing need! They began with OEM and ODM and have now produced over 60 million bags for 4000 satisfied customers all over the world! The founder of Terminus and some of the designers of these unique bags. You could say Terminus is "The World's Local Brand" as they ensure their brand makes you feel at home, no matter where you are. No other brand functions like this whereby they work with talented designers worldwide, as opposed to working with specified designers within the team, to combine truly global style and high quality products. The wide range of colourful and unique bags found in Terminus! Idk why I feel the store is an organised mess.. I love it even though it's such a small space. With decades of experience, this has helped Terminus to skillfully craft bags that are Functional, Uniquely Formed, Fashionable, Fun and Feels Good. To be honest, before stepping into the shop, the bags did not catch my attention.. Until I had a demonstration from the sales assistant in the store! Just wanna share some notable products with you guys that I think are totally cool and fun! 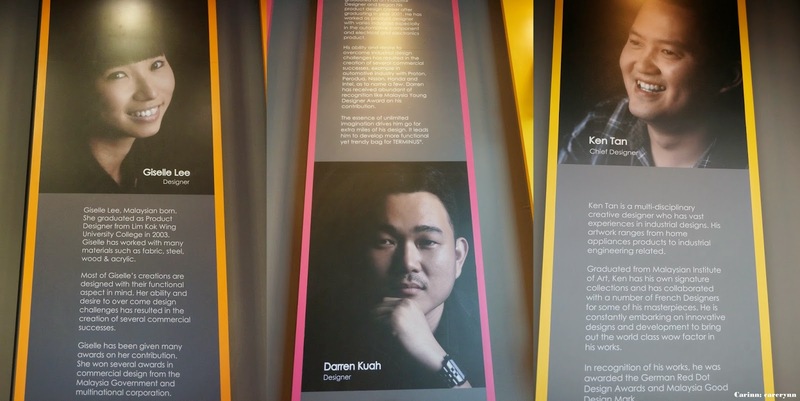 Most of their products have won multiple Red Dot awards internationally and locally. Introducing the 5-in-1 Transformer Bag (RM 699.90). It looks like a luggage, but you can actually unzip the top compartment and bring it to meetings as a working bag! GENIUS. There are loads of compartments and ample luggage space in the bag, labelled with cute fonts and cliparts so you'll remember where to keep your stuff. Notice that this bag is suitable for the working traveller, there are compartments for your flight tickets, passports, phone and more. They even provided a first-aid kit and toiletry bag inside! It's a hassle to bring so many things, so many bags out for your baby for a day out, but this bag solves it all. The cute smiley face thingy is actually a space to put wet tissue that you can just pull out from the bag! There's also compartment for milk powder, bottle warmer and even a diaper changing mat! The best part is, the backpack is not too bulky and it's fully waterproof. Bright Tote (RM 469.90), something for the ladies. Ladies, have you ever been in a situation where you just can't find your phone in the deep, dark crevices of your bag? Bright Tote not only looks fashionable but is also lightweight and very spacious! I was quite surprised that this bag can fit your phone, water bottles, iPod so you won't misplace them, but it can also fit a laptop and charger! Perfect for college girls. Love the fluffy compartment to cushion your laptop hehe. 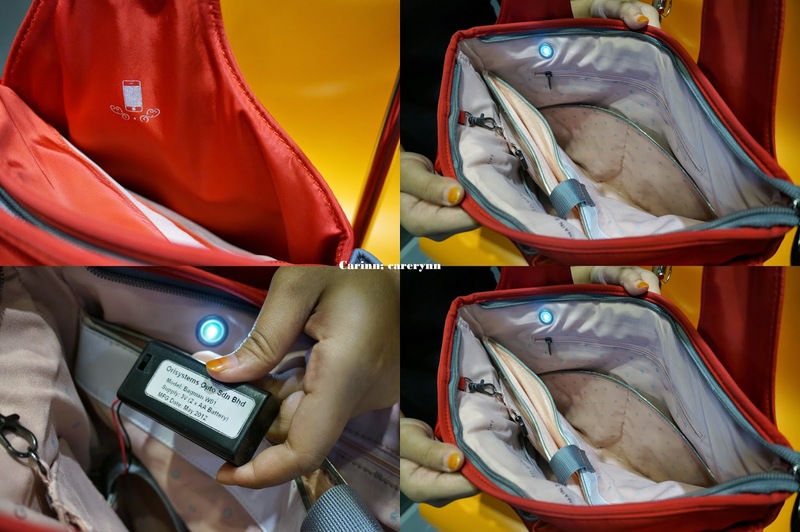 The best part is it has a built-in LED light which runs on batteries that lights up as soon as you open the bag. Gotta be my fave bag of the lot! Another innovative bag is The New Invisible Urban Roller. Why the name? 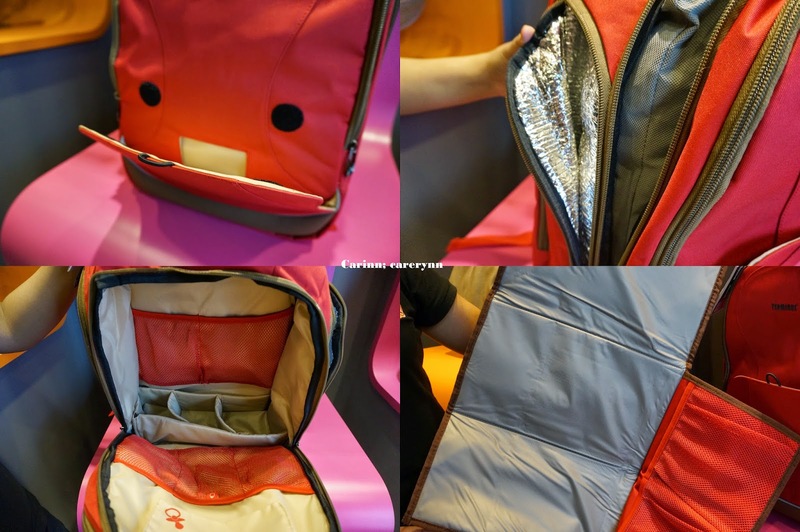 Because it has a roller and handle that disapears into the bag and transforms it into a backpack in an instant! Aside from luggages, Terminus also has backpacks and laptop and table bags that come in various colours. Another super cute bag that I found is this Pillow Bag! It's great for students cos after a long day of doing assignments on your laptop, you can just convert the bag into a pillow and take a nap! So adorable, and it also helps to cushion your laptop! I can't stop hugging it, it's so soft and squishy HAHAH. 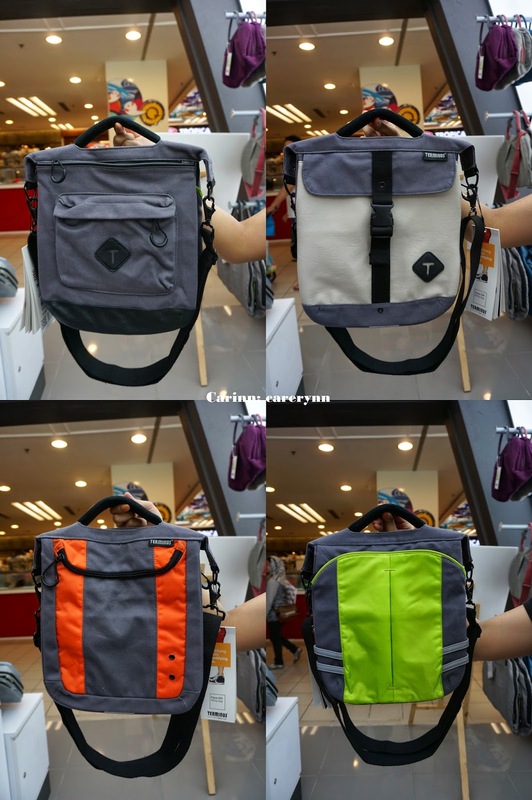 If you're bored of the same bag everyday, this Terminus Face-Off Messenger Bag can be flipped four ways and used for four different occassions, depending on your colour preference and mood! 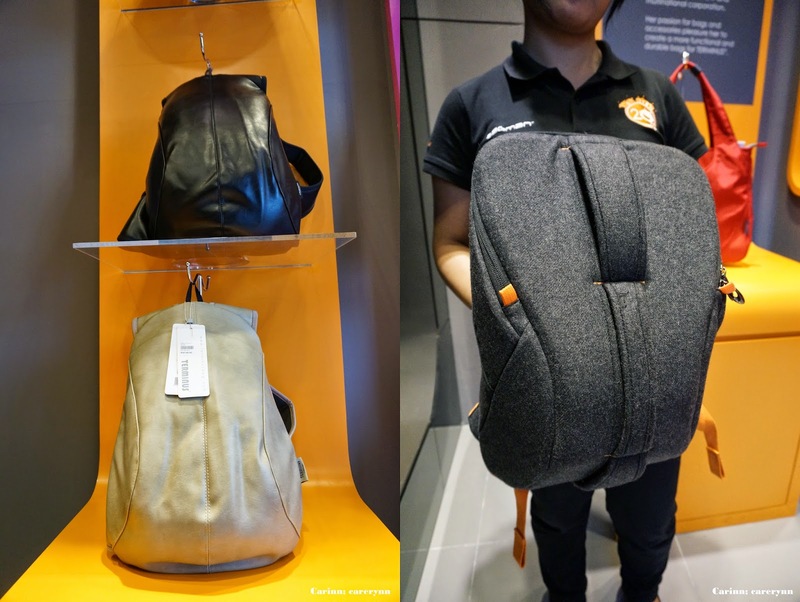 This Laptop Backpack is ultra lightweight that you don't feel like you're carrying anything, seriously. It also comes in leather and wool material. The only setback is that you'll look like Teenage Mutant Ninja Turtle carrying a shell-shaped bag on your back HAHAHA. My mum would like this. 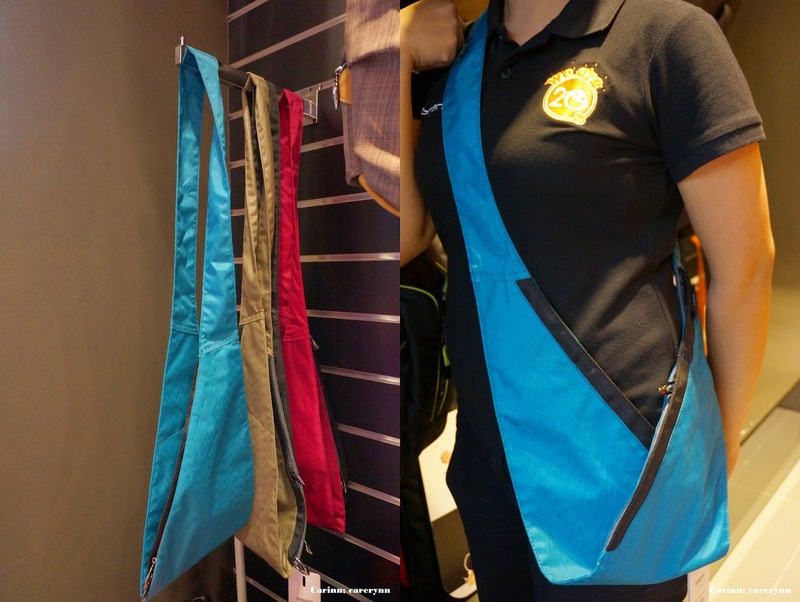 I was really curious how such a flat and thin bag can carry anything but the sales assistant explained that this Terminus Ez Sling good for travelling and concerts because you can wear it underneath your coats or jackets and avoid pickpockets. Good idea! This crumpled bag lets you crumple it into any design you want depending on your creativity, or you can just opt to straighten the material and carry it as your everyday backpack. My final takeaway after visiting the store is that Terminus is not only innovative but they're really detail-orientated and they really take into account every little aspect of everyday problems when designing the bags. If you thought bags were only for carrying your things, Terminus bags will prove you wrong. The bags may be slightly pricey, but think of of the amount of time and energy you'll save when you get trivial problems out of the way! Unlike ordinary bags, Terminus offers creative packing solutions for today's on-the-go, style-conscious and digital-orientated generation. So it doesn't matter if you're into a more sophisticated, active or professional lifestyle, whether you're going to work, school or simply spending the day with family, you will find a convenient and innovative bag beyond your imagination that you will be proud to own. To purchase the bags, drop by Terminus's new store in One Utama Shopping Mall or log on to their website. You can also find them on Facebook! Disclaimer: This may be a sponsored post but the review is based fully on my honest thoughts, opinions and preferences after trying out the product and services. Use to hope to get a bag which is also a pillow because I need it for boring classes! XD Not only for travellers, students like me that require laptop is so suitable to get the pillow bag!